This is a super simple way to give a shoulder of lamb a lovely dressing up. Similar to the duck pasta in my last post this is a recipe I have made lots of times so I have played with it a little. Jamie just says to place the rosemary and unpeeled garlic cloves underneath and on top of the lamb, but if I have time and can be bothered I also chop some of it up and make deep incisions in the meat with a sharp knife. 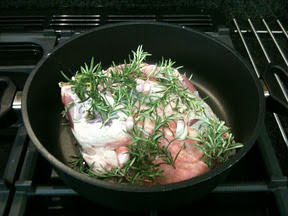 I then push pieces of rosemary and garlic into the slits in the meat. Today I also added some small slices of anchovies as I had them in and lamb loves anchovies. If you don't love them as much don't worry they totally melt away and just leave a lovely savoury flavour. I still put the lamb, in an oven proof tin or pan, on a bed of rosemary and unpeeled garlic cloves and then more on the top. A whole bulb of garlic sounds like an awful lot but when garlic is roasted it changes from being quite potent to a lovely mellow flavour. Next it's time to roast the meat. Start by heating your oven as high as it will go. Once it's up to temperature then put the meat in and turn the temperature down. Jamie says to roast it for 4 hours but I like to do it at a slightly lower temperature (140C) for about 6-7 hours. Once it's cooked remove it from the tin and leave it to rest in some tin foil. Just before serving pull the lamb from the bones using two forks. Pour most of the excess fat from the tin/pan and then use the delicious juices and scrummy bits to make the gravy. It is well worth making the gravy it is far far superior to gravy made from granules and not at all difficult. The gravy is finished with chopped mint which really lightens the gravy and means you don't also need mint. Jamie serves it with smashed root veg and greens which it delicious, but as it was sunday. I decided to go for roast potatoes (skip these for a paleo and clean option), greens and carrots instead. 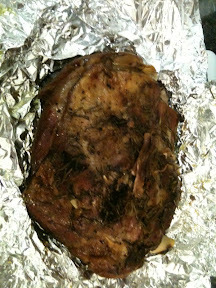 And here is the shoulder once it has been cooked ready for resting.